The Pacific Coast Shootout was established in 2014 in an effort to bring the top Division I teams to the West Coast to play a regular-season game. In its inaugural year, the Shootout did just that - showcasing two of the nation's top Division I lacrosse programs in Denver and Notre Dame. Since that time, the Shootout has played host to many of Division I's top programs: Cornell, Denver, Maryland, Notre Dame, North Carolina and Virginia. The Pioneers defeated the Fighting Irish 10-7 before a crowd of almost 6,000 fans at LeBard Stadium on the campus of Orange Coast College. Former Foothill Knights (Santa Ana, CA) attackman Erik Adamson scored a career-high 6 goals to lead Denver to the win. Perhaps participating in the Shootout is a good way to start the season, as both teams went on to play in the NCAA Division I Final Four in late May. In the event's second game, 2014 MCLA semi-finalist UCSB defeated LMU 12-7. The 2015 Shootout featured the Tar Heels of North Carolina (ACC) and the Terrapins of the University of Maryland (Big10). Both programs are former National Champions and perennial powers in Division I college lacrosse. Maryland defeated its former ACC rival 10-8 before a crowd of 6,785 fans at Santa Ana Stadium. In 2016, the eigth-ranked Maryland Terrapins returned a year after making their first appearance in the Shootout to take on the top-ranked Fighting Irish of Notre Dame. The Irish defeated the Terps 9-4 in front of a sellout crowd of 6,970. The 2017 Shootout became an "Instant Classic," as another outstanding West Coast crowd was treated to one of the most exciting college lacrosse games in recent years. Both Virginia and Cornell scored goals in the final 14 seconds to send the game into overtime where the Wahoos eventually won 19-18. In 2018, Maryland and North Carolina returned to the Shootout, playing before another sold out crowd at Orange Coast College (the event's second). The Terps defeated the Tar Heels 11-7 on their way to another appearance in the NCAA Division I Final Four, where they lost to Duke in teh Semi-Finals. The Shootout seems to be somewhat of a path to the NCAA Division I National Championship with past participants Denver (2014), North Carolina (2015), and Maryland (2015 and 2016) winning the ultimate prize just one season after participating in the Shootout. Notre Dame (2014 and 2016) and Maryland have both made appearances in the NCAA Championship game after playing in the Shootout - the Irish in 2014, Maryland in 2015, 2016 and 2017. West Coast lacrosse is booming. Each year, more and more players from California are appearing on the rosters of traditional college lacrosse powerhouses. 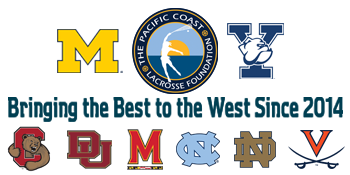 The ultimate goal of the Shootout is to promote the high quality of lacrosse being played in California and the West, while exposing these developing players and programs to the best collegiate programs in the game. In short, its a cross-promotional platform to help further grow and develop the game along the Pacific Coast.